Help us identify these families! 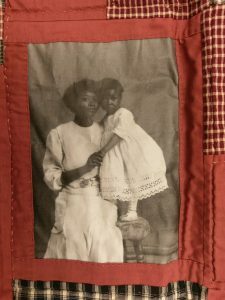 In honor of National Quilting Day, research conservator Annaick Keruzec takes a closer look at several quilts with photographic patches in the museum’s collection. Quilts are made for comfort, to decorate a home, or to tell a family story. For a textile conservator like myself, each quilt is unique and fascinating. Crafted from small pieces of fabric, they carry within them things that were part of the quilt maker’s environment. I can spend hours researching each fabric square, identifying fibers through the microscope or combing through historic sales catalogues to date and source the fabrics. I can examine how they were selected, arranged, and stitched together. I can document and admire the handiwork, the color combinations, and the artistry. Quilts are richly textured objects, full of connections and personal choices made by the maker. Indeed, researching quilts can offer remarkable insights on the person who made them. Shroud Series #2, Quilt by Fay Pullen Fairbrother. Photographed during examination in the collections processing room of the museum. 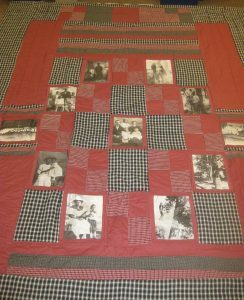 Several quilts in the museum’s collection incorporate squares with photographic images printed on them. This gives an added layer of complexity. How were they made? Why were these photos chosen? What was the artist’s intention? 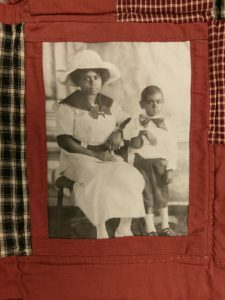 I am collaborating with a photo conservator and conservation scientists at the Smithsonian’s Museum Conservation Institute (MCI) to document these photographic quilts historically, technically, and personally from the artist’s perspective. In the next few months, we will analyze the fabrics, inks, emulsions, and binders used to create the photo patches – and we will report on it in this blog. I’ve been examining a set of seven quilts created in the early 1990s by the artist Fay Pullen Fairbrother (1948-1997). 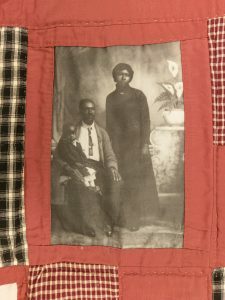 Collectively titled The Shroud Series, they incorporate turn-of-the-century photographs depicting family portraits, lynchings, and the Ku Klux Klan. 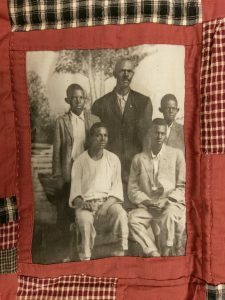 In an artist statement shortly after she made the quilts, Fairbrother wrote that the photographs of the KKK activities, studio portraits of black and white families, and lynched men clearly reflected a dissolution of family values and morals, Christian or otherwise. She chose to accentuate the dissonance of the violent imagery by juxtaposing it with quilt making, which has associations of comfort and family. The images stand out among the patchwork of the quilt. I’ve been sourcing the images for the 50 photo-patches Fairbrother created, although I am not sure where and how she located them pre-internet. She reused some images, so they constitute a total of 24 different photographs. Among them are eight photographs depicting lynchings. Lynchings were public events that were described and recorded in local and sometimes national news. Some were depicted on early 20th-century postcards. I have identified the men in four photographs as Bennie Simmons (1913), Thomas Shipp and Abram Smith (1930), Claude Neal (1934), and Rubin Stacy (1935), whose photographs are published in Without Sanctuary: Lynching Photography in America (2000). Four other scenes remain unidentified. 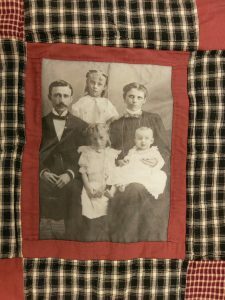 On three of the quilts in the Shroud Series, Fairbrother incorporated family portraits. They show well-dressed black and white families posing against draped studio backdrops. In contrast to the lynching photographs, the portraits are private and personal. Family portraits are also ubiquitous, and it is hard to describe them in a way that is unique. As a result, portraits are difficult to research and document. I have contacted archives to which Fairbrother might have had access, but have not yet located the images she used. Please help us identify the five family portraits shown above and below! Have you seen these photographs or any like them? Let us know in the comments section. Our scientific research on the quilts will continue to reveal Fairbrother’s technical processes. Meanwhile I am hoping to discover more about the artist’s life and sources of inspiration for her exceptional quilt series.